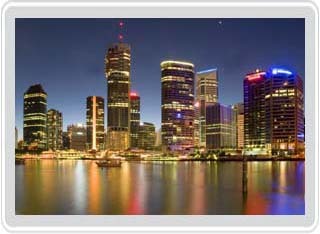 Known as the most ‘livable-city’, in Queensland, Brisbane is Australia's capital of good living and leisure. Its architectural delights include a unique mix of modern and old buildings - impressive ‘Renaissance-style’ and timber Queenslander dwellings sharing the city space with modern skyscrapers. Despite having the ocean nearby Brisbane is very much a river-city, with the Brisbane River flowing right through the city’s cosmopolitan attractions, providing a stunning backdrop.It will take you an hour to travel from Gold Coast to Brisbane City with Gold Coast car rental. With Brisbane's well maintained and easily accessible roads, our visitors don't mind exploring the many and varied tourist spots on offer in and around the city with our Brisbane car hire service. The nightlife on offer in Brisbane is very popular with many tourists and the lively bars and clubs are usually a favorite. The Conrad Treasury Casino looks out over the Brisbane River and is a huge draw for many people, while for shoppers our Queen Street Mall is a definite winner. Don’t miss out on driving to the nearby wonders of Moreton Bay, only an hours drive from the city centre with help of our Brisbane car rental. Also worth a visit is the charming Manly Harbour which is the East Coast's largest pleasure boat marina boasting many quaint buildings, good food and shopping. Our neighboring Moreton Island has the world's highest coastal sand dune and its friendly dolphins. Our Car Hire Brisbane is available to suit people with any style of budget and our customers can enjoy their trip to Brisbane knowing they are paying a great price for hire cars. As one of the leading Car Rental Brisbane companies, Select Rent a Car offers a wide range of car hire options for their customers: from economical sedans to spacious people movers, convertibles, midsized family sedans and small cars, we have the perfect option for your holiday or business trip. Select Rent a Car’s Brisbane Car Rental office is open seven days a week. We also provide Surfers Paradise car rental if you are planning to visit the fantastic and famous beaches of Australia. If you just arrived in the airport, rent a car from car hire Coolangatta airport would be the best way for a hassle-free travel. Our friendly staff are available on our toll free number to answer any general or booking enquiries you have. Easy car pickups from the Brisbane Airport and convenient office locations make car rental with us simple and convenient. As the region’s preferred car rental company for over two decades, we have available state-of-the-art and handy accessories including satellite navigational units, baby seats and UBD maps. Let our staff know if you have any special requirements when you make a booking so we can ensure that we have everything organised on your arrival. For more detailed information regarding our Brisbane Car Rental, please contact us. Brisbane Car Hire: for the list of available cars, please use the form located in the Select Rent A Car homepage. We also recommend the use of Cutprice Car Rentals for your Brisbane Car Rental needs and Suncoast Car Rentals for your Car Hire Brisbane requests. Cheap prices combined with quality customer service in Gold Coast, Brisbane, Surfers Paradise and Coolangatta Airport car hire. Gold Coast Car Rental | Coolangatta Airport Car Rental | Surfers Paradise Car Rental | Brisbane Car Rental | Blog | Like Us on Facebook!